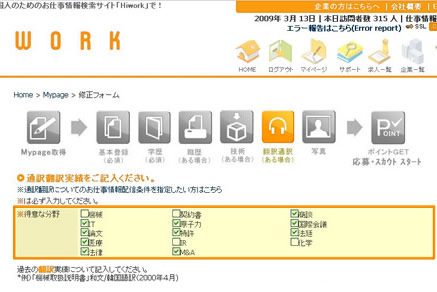 Confirmation of registration for｜Hiwork, the work-info search site for foreign employment and job transitioning in Japan! Our new site for widening your chances of finding work. We have launched the "Translator Search" and "Interpreter Search" functions. They allow companies that are looking for foreigners to search for personnel resources that match their conditions among the everyone registered as staff on our site. 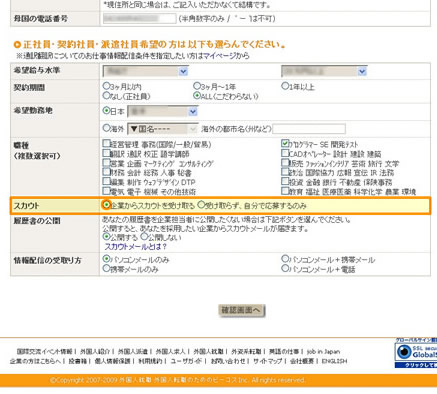 『Basic Info: PROFILE』 *Select "Accept Company Scouts" from "Scout" at the page bottom. *Check the items from "Specialized Fields" in the upper section that match you most. And you're finished. Thank you for updating!